Recording data, automated checking, investigating, resolving and reporting are core to governance, Risk & Compliance. Ensure all potential rule breaches are investigated, assessed as breaches or non-breaches and are resolved. Produce the reports required by law enforcement, regulators, owners/management and clients to prove internal controls. Record and store the data required to prove compliance with laws, regulations, contracts and internal procedures. Flag potential rule breaches with automatic checks. All flagged rule breaches launch the GRC Case Manager. GRC-Maestro can support a wide range of laws, including: financial, employment practices, health and safety, data protection/secrecy, etc. 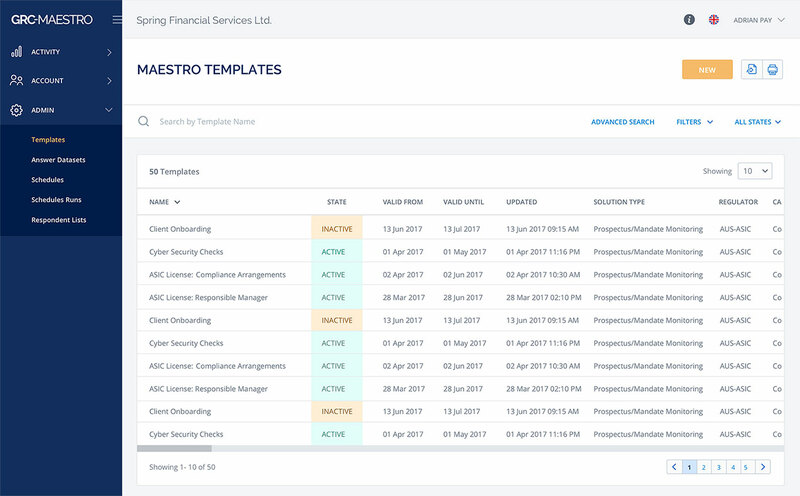 Rules published by financial regulators can be managed on GRC-Maestro, including: AML, licensing, outsourcing, financial products, senior management responsibility, etc. Firms can manage their own internal policies on GRC-Maestro, including: code of conduct/ethics, internal processes/checks/controls, commercial information, etc. When firms contract with suppliers/customers or enter Service Level Agreements (SLAs) these can be monitored and managed on GRC-Maestro. Packaged Maestro-Solutions use pre-built Maestro-Templates to meet a range of statutory or regulatory requirements. Users can copy and edit Templates as required, both on initial implementation and as legal, regulatory, contractual or internal policies/procedures change. Users can set up their own Templates based on their specific requirements, e.g. client/vendor contracts, internal policies/procedures, etc.